Recorded as Hagard, Haggard, Hagart, Haggarth and possibly others, this is an English medieval surname. It has three possible origins. The first is job descriptive for a haggart or haggerter, described as being a trainer of hawks caught in the wild, whilst the second possible origin is Danish-Viking and from Agard. This was a locational name from the city of Agard in Denmark. It is also possible that on occasions it was used as a medieval nickname for a "wild and untamed" person! In this case the derivation is from the Olde French word hagard, introduced into the British Isles after the Norman Conquest of 1066, after which and for nearly three hundred years French was the written and often spoken, language. The name development includes recording examples such as that of Anna Haggard who married James Crimble on October 8th 1684, at St. James Church, Dukes Place, Westminster, whilst Dinah Haggarth was christened at the church of St. Mary Whitechapel, Stepney, on August 5th 1759. The Author Sir H. Rider Haggard (1856 - 1925), wrote the ever popular book "King Solomon's Mines". 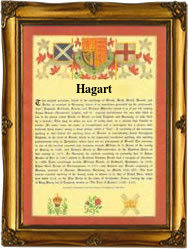 The first recorded spelling of the family name is shown to be that of Alice Haggard. This was dated 1275, in the Hundred Rolls of landowners of Worcestershire, during the reign of King Edward 1st, known as "The Hammer of the Scots", 1272 - 1307. Surnames became necessary when governments introduced personal taxation. In England this was sometimes known as Poll Tax. Throughout the centuries, surnames in every country have continued to "develop" often leading to astonishing variants of the original spelling.